Many Old Stortfordians will have fond memories of time spent on the North Norfolk coast at Church Farm, Happisburgh. Following the death of Digby Wakeman (SH/AH, 44-48) in 2009, the remaining Officers felt it was an appropriate time to pass remaining Club funds to the OS Society. It was the responsibility of the OS Committee to allocate these funds in the form of fitting tributes to the Hasbro’ Club for the benefit of the School with any balance going to the OS Benevolent Fund. The OS Committee have, over the past couple of years, been in contact with a number of the members of the Hasbro’ Club to gauge their opinion on how best to mark this. After much deliberation it was agreed to purchase two new flagpoles to be sited outside the entrance to the Doggart Pavilion. In addition a brass plaque and framed History of the Hasbro’ Club was sited just inside the Doggart Pavilion on the right hand side of the Home Changing Room. 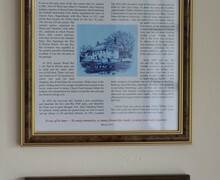 A second framed copy of the History of the Club was placed in archive in the Library. It was also agreed to purchase a tree in memory of the Club which will be planted in the Autumn in the School’s Arboretum. 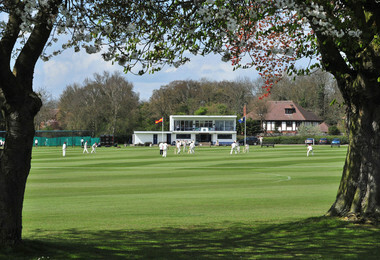 The flagpoles were installed at the end of April 2013 and were in place just in time for a Cricket Match against MCC at which both sides were able to proudly fly their flags.